Believe me, I understand how things in sports media works, everyone overreacts to everything. Thats how takes become hot. I also understand how recency bias works in sports media. That’s why there were a lot of people who agreed with me the morning after Isaiah’s 53 PT performance against the Wizards in Game 2 when I said that the Celtics should extend IT with a max contract and build the team around him. Which is strange, because those same people who agreed with me back on May 3rd have now pivoted and changed their minds. Now, they believe that the Celtics should move on from Isaiah. That the team looked better without him. That he is a defensive liability. That he is 28 years old and giving him a long term deal is not smart. However, I do not fall victim to the recency bias. I do not spit out hot takes to get clicks, because to be honest, everything that I write on this website is exactly that, honest. I am not here to be a troll, and I am definitely not here to say something I don’t believe. And what I believe is that Isaiah is the best player on the Boston Celtics. I believe that Isaiah is going to be 5th in the MVP voting this season. I believe that Isaiah and John Wall are the 2 best Point Guards in the Eastern Conference. I believe that Isaiah is the leader of this team and I would extend him without thinking about it. Isaiah is a max contract player, I don’t think that is even a debate anymore. He is going to be in the MVP conversation and was the the NBA’s 3rd highest scorer while leading the league in scoring in the 4th quarter. I know he is not a great defender, but most of the Point Guards in the league aren’t good defenders. The only reason we talk about Isaiah’s defensive skills is because of his height. We don’t talk about Steph Curry, James Harden, Damian Lillard and Kyrie Irving’s defensive deficiencies. Isaiah is a volume scorer and one of the most efficient scorers in the entire NBA. The fact of the matter is that the Celtics wouldn’t have made it this far without Isaiah and they wouldn’t have gotten even close. Isaiah has transformed the Celtics to a team that was lottery bound to the #1 seed in the East. When people say that Isaiah needs the ball and can’t play with projected #1 pick Markelle Fultz, they don’t know what they are talking about. The NBA today is positionless, just because they are both ‘Point Guards’ doesn’t mean they can’t play together. Isaiah is great off the ball, and having 2 Guards who can score would be deadly for the C’s. Isaiah is a max player and losing him makes this team worse, not better. Marcus Smart is not the 2nd coming of Steph Curry. That is just not sustainable to think the Game the other day is an accurate demonstration of what the Celtics would be without IT. The Celtics are in an unbelievable situation where they can build a team to compete with the Cavs now, while simultaneously building a team for the future that can win when LeBron is not the world beater that he is today. So please, for the love of god, stop letting your recency bias overcome what we have seen this whole season. 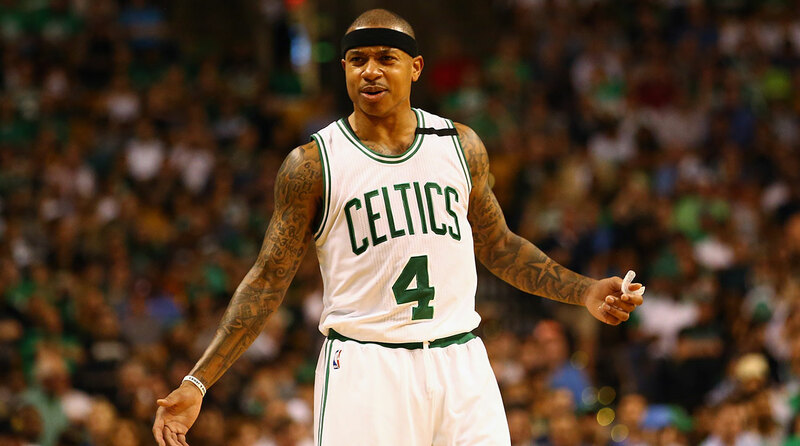 Isaiah Thomas is one hell of a player and should be the Celtics franchise player for the upcoming future. Draft Markelle Fultz 1st overall. Sign a max free agent this summer. Then extend Isaiah Thomas. Banner 18 here we come.